March 4, 5, 6, 7 & 8, 1969. NLR wrote: “A School for Scandal – needs there a school this modish art to teach you – as might as well be taught to eat and drink” – so said Mr. Garrick in a prologue to Sheridan’s satire on the popular pastime of the society of the mid-Eighteenth Century. With broad sweeps of the pen and cutting candour he contours every facet of this scandalous affair – the schizophrenic brothers, neither of whom is what he appears on the surface – the murmuring of the teazer to a perfect partner – one vulnerable to teasing. The sneering backbiting aristocrats and the crab old batchelor [sic] – the veritable snake in the grass selling his art of scandal mongering to the highest bidder. A wide-eyed and white-shouldered charmer is young Brighton actress Susan Welton. Susan, just 23, is pictured above [we might get to scan the picture but not yet – web ed] as she will appear from tomorrow (March 4-8) as Lady Teazle in Sheridan’s comedy The School for Scandal. That will be in the theatre, a cleverly converted barn, at Southwick Community Centre. The production by the Wick Theatre Company is directed by Brighton theatrical costumier Nikki le Roy, who scored a recent success with the same play at Lewes Little Theatre, were Susan also appeared. She was last seen at the Barn in tropical undress, as the only girl marooned on a desert island with three men in the Company’s The Little Hut. Susan, who lives in Hollingbury Road, has been putting son Mark, aged four, early to bed during the past few weeks before rushing to Southwick for rehearsals. “It should be a very entertaining show”, she said, “Sheridan gets ruined for lots of people by having to plough through it at school. The play is a witty comedy of manners. Nikki’s interpretation has a new, light touch,” she says. She could well be right. The word seems to be getting round, for Saturday night’s tickets are already sold out. If you want tickets, call Southwick 4114. THE Wick Theatre Company’s presentation of Sheriden’s The School for Scandal at the Barn Theatre, Southwick, this week, leaves nothing to be desired for colour, wit and superb acting by a large cast. Nikki Le Roy, actor and producer, brings to the production a wealth of experience and enables the players to get every ounce of humour out of this scintillating comedy. Lady Sneerwell, in whose house the play opens, immediately springs to life in the vivacious personality of Jean Porter, and Patrick Johnson is perfectly foppish as Snake. Barrie Bowen’s performance as Joseph Surface commands respect, and the part of Maria is sympathetically portrayed by Susan Brown. Valerie Bingham cleverly reveals in the character of Mrs Candour, and David Creedon as Crabtree and Anthony Deasey as Sir Benjamin Backbite make an ideal pair of gossips. Though small of statute Nikki Le Roy commands the whole stage when he appears as Sir Peter Teazle, such a wealth of stage craft does he bring to his acting of the crabby old bachelor married to a young girl. Rowley, portrayed by Graham Loder, is another good study. Sue Welton is regal as the young and pretty Lady Teazle, and Ralph Dawes excels as Sir Oliver Surface. Fine performances are also given by a member of the Southwick Players, Richard Nicholas, as Moses and a member of Lewes Little Theatre Club, Nicholas Betteridge, as Charles Surface. Other parts are well played by Patrick Johnson as Careless, Michael Harrington as Tripp, and Monica Joyce as a demure maid. Richard Porter, David Curtis, Frances Thorne, Margaret Perrett and Juliet Robyns appear as gentlemen and servants, and a special word of praise is due to Yasuda Avery, Pamela Newman and Ann Deasey, as very small blackamoors. Staging, lighting and costumes are excellent, among those responsible being Michael Harrington, Frank Hurrell, Terry Mase, Morfydd Bowen, Ian Elliott and George Porter. Costumes were from Le Roy of Brighton. RESTORATION comedy is almost an art form in its own right. So much depends on the stylised movement, the exact phrasing and an indefinable atmosphere that must be created. For an object lesson in how this complicated business should be handled, you should see Nikki Le Roy’s production of The School for Scandal, by the Wick Theatre Company at the Barn Theatre, Southwick. You may, indeed, not have this opportunity, because quite early in the week there was but a handful of places left for tonight and tomorrow. Sir Peter and Lady Teazle, around whose household the tortuous plot revolves, are played with distinction by Nikki Le Roy and Susan Welton, Sir Peter a model of elderly irascibility, his young wife the epitome of charm and grace. The profligate Charles Surface is played smooth and amiable by Nicholas Betteridge of Lewes Little Company, his brother Joseph, smooth and manly by Barrie Bowen. The scandal-mongering crew are Lady Sneerwell, a perfect character of the time as played by Jean Porter; Mrs Candour, more candid than kind, played by Valerie Bingham; David Creedon as the dandified Crabtree and Anthony Deasey as the equally dandified Sir Benjamin Backbite. Patrick Johnson is an outstanding Mr. Snake and there must be a special word of praise for Monica Joyce as the Maid. Ralph Dawes is an authoritative Sir Oliver Surface; Graham Loder is, perhaps, a trifle negative as the friend Rowley. Richard Nicholas, of the Southwick Players, is the money lender Moses; Mike Harrington is Trip, and Colin Lydon, Terry Phillipe, Frances Thorne and Margaret Perrett appear as gentlemen and servants with Patrick Johnson as Careless and Yasunda Avery, Pamela Newman and Anne Deasey as the little blackamoors. Costumes throughout are quite lovely, but when everything is said of the play, the acting, the admirable stage sets, the lighting and the music, one gets down to the really skilled direction of Nikki Le Roy, without which expertise no Restoration play can hope to succeed. I do hope you can get to see it. 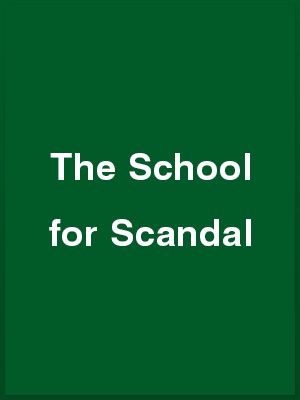 Sheriden’s famous satire The School for Scandal is a play that, in the wrong hands [professional or amateur] can be boringly mannered to the point of absurdity. The Wick Theatre Company are proving well able to steer clear of the customary pitfalls in their current production, which ends tomorrow night, at the Barn Theatre, Southwick. Directed by Mr. Le Roy, and superbly costumed, these players possess a high degree of acting ability, and, in fact, make the most of what is a veritable bean-feast of opportunities to display histrionic powers in the sneering, back-biting, licentious, aristocratic world inhabited by such “creeps” as Snake [Mr. Johnson], unctuous friend of pretty Mrs. Porter, whose pampered, peevish Lady Sneerwell is an extreme pleasure to study. Maria, much-sought-after centrepiece of the play, is delicately played by Miss Brown, and there is necessary pomposity in Mr. Bowen’s treatment of Joseph Surface. What a piece of autocracy, spiced with total malice, we are presented with Mrs. Bingham as elegant Mrs. Candour – a creature of high fashion whose observations are always tinctured with cruel acidity. Mr. Deasey fully lives up to his name as Sir Benjamin Backbite – a man whose futile epigrams are well advertised by lisping Mr. Creedon as Crabtree. Director Le Roy portrays henpecked Sir Peter Teazle with just the right touch of injured pride and pathos. Mr. Loder is suitably deferential as his right-hand-man Rowley, and Miss Welton is delicious as his extravagant, socially-conscious wife, Lady Taezle, whose outrageous flirtations with all and sundry make additional mockery of any hint of true conventions in this slice of 18th century England. Sir Oliver Surface and Charles Surface receive dignity at hands of Mr. Dawes and Mr. Betteridge – the latter appearing by permission of The Lewes Little Theatre club. Mr. Nicholas, of The Southwick Players, makes an admirable Moses, while Mr. Johnson and Mr. Harrington provide a lighter touch as Careless and Trip. Pretty deference is the hallmark of Miss Joyce’s Maid, and the white clad Blackamoors [in three sizes] are delightfully introduced by the Misses Avery, Newman and Deasey. Finally, Gentlemen and servants are well acted by Mr. Lydon, Mr. Phillippe, Mrs. Thorne, Mrs. Perrett and Miss Robyns.